Enjoy all of the benefits and features that this energy efficient, sprawling 2940SF home has to offer! The open floor plan and large bedrooms benefit from the south facing wall of windows that provide generous natural light. Beautiful granite counter tops in the updated kitchen, as well as the large laundry room and master bath. When you're not enjoying the wonderful view of the natural waterfall from the hot tub, you will love spending time relaxing in the sun room. Or, reading your favorite book in the light filled sitting room off the master. There is also ample storage and workshop space in the house, attached garage, and steel outbuilding.This well thought out and well built property has a long list of recent updates and unique features. The roof, skylights, HVAC, and attic insulation are just a few of those updates. The Classic wood fired boiler is a recent addition and provides comfortable in floor radiant heat as well as an unlimited supply of hot water when in use. You will also enjoy having the automatic Generac 22KW whole house generator. A large fenced in backyard provides a safe place for kids to play and the family animals to hang out in. 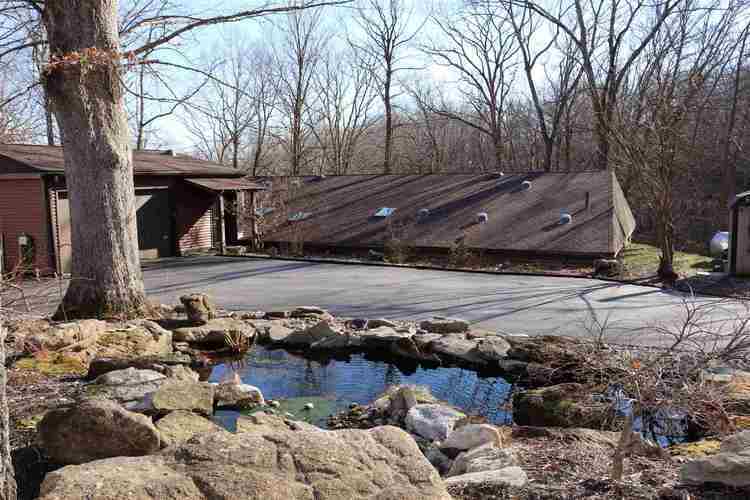 The Seller's have loved the wooded setting, and have enjoyed all that nature has to offer. All four seasons are beautiful on this peaceful property. The birds, deer, owls, wild turkeys and more are always entertaining to watch as well. 3.7 acres located just off of SR37, but a world away from everything! Directions:37 South to Zikes Road. Turn left, then immediately turn right onto S Zikes Road. Sign at driveway.